Prototype: German Federal Railroad (DB) class 98.3 "Glaskasten" / "Glass Box" (former Bavarian class PtL 2/2) without a jackshaft, two different Bavarian design type LC local railroad passenger cars, 3rd class, and one type G 10 boxcar with a brakeman's cab and end area reinforcement. The train looks as it did around 1952. Model: The locomotive has an mfx+ digital decoder and extensive sound functions. It also has a miniature motor in the boiler. 2 axles powered. Traction tires. The dual headlights change over with the direction of travel, will work in conventional operation, and can be controlled digitally. The locomotive has an operating current-conducting close coupler. The inner boiler is constructed of metal. The locomotive has numerous separately applied handrails and grab irons. The boiler parts and other details are finely reproduced. Length over the buffers 8.0 cm / 3-1/8". Both passenger cars have factory-installed LED interior lighting and operating current-conducting close couplers. The power supply to the cars comes from the locomotive. 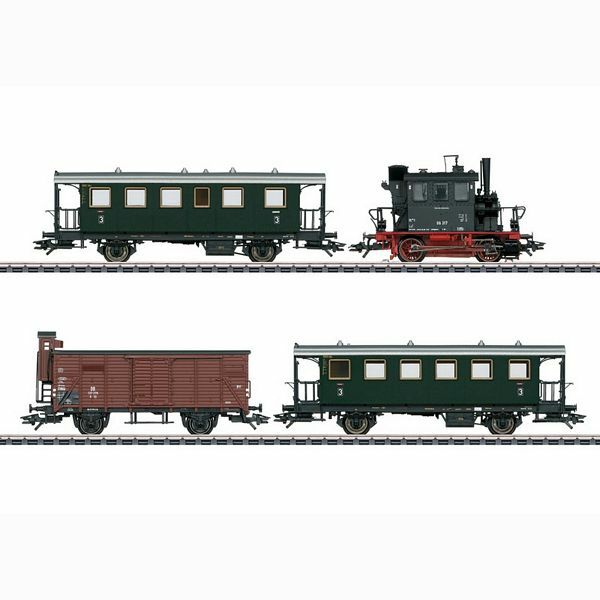 The 2-axle boxcar with a brakeman's cab is the last car in the train and includes end of train marker signs that you can install on your own. Total length over the buffers about 47.5 cm / 18-11/16". The legendary DB class 98.3 (former Bavarian class PtL 2/2) branch line locomotives were seldom designated with their exact class number, because these agile branch line units were much better known by their nickname "Glaskasten" / "Glass Box". This endearing name owed its origin to the comparatively voluminous cab that even surrounded a large part of the boiler and that gave the engineer a good view of things on the railroad thanks to generous windows. 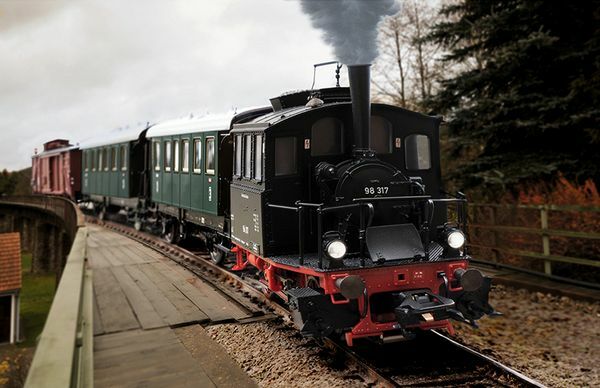 You can now get this branch line legend for the first time with elaborate sound features.